Join us to help make women at Calvary feel celebrated and special! Each month, we host a birthday party for women whose birthdays fall within the month. 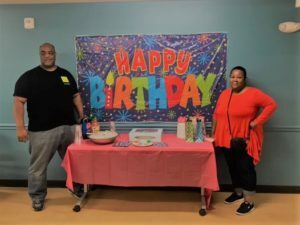 Volunteers plan and host birthday parties with a small group of 4-6 volunteers, and are responsible for providing decorations, a cake (or other birthday party food) and a small gift bag for each woman who has a birthday. Birthday parties take place on the first Saturday of the month, from 7:00 – 8:30pm. Your team of volunteers should plan to arrive at 6:30pm to set up. All Calvary residents are invited to enjoy birthday parties, and typically 10-15 attend, including 4-5 who have birthdays in the month. We require our volunteers to make a commitment to host 3 birthday parties per year with the option to extend based on the volunteers’ availability. Three parties per year, from 6:30 – 8:45pm on the first Saturday of the month. Ready to host a birthday party at Calvary?